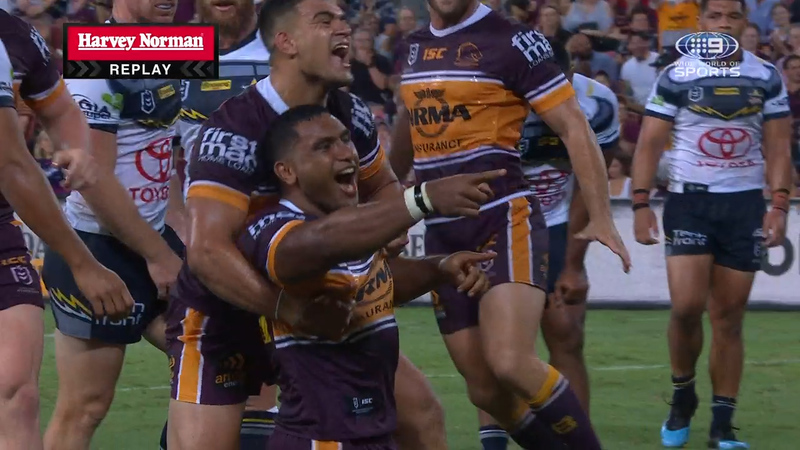 Broncos powerhouse Tevita Pangai Junior has stolen the spotlight in the QLD derby, devastating the Cowboys with an unrelenting physicality to see Brisbane to a 29-10 victory at Suncorp Stadium. "When Tevita Pangai Junior is running around on this field, I want nothing of it," said Billy Slater on Nine's NRL commentary team, and It's a feeling that would have been rife amongst the visitors on Friday night. After an emphatic display in Townsville not six days ago, the highly touted Cowboys front-pack yielded to the brutality of the 115kg Tongan who was first off the line to meet every tackle on almost every occasion. The most telling of which was an early heavy hit on North Queensland favourite Jason Taumalolo who was folded back awkwardly on his right knee, in an ailment which he never seemed to recover from. "He’s going to be an immortal one day, and I just really respect his game," Pangai Junior said of Taumalolo on Nine's Friday Night Knock-Off. "I grew up watching his game, he played with my brother and I have a lot of respect for him…he’s the king of Tonga.